Bring the benefits enjoyed by Raspberry Pi users, who don't require a separate boot USB stick in addition to an SD card, to other RISC OS platforms - you get the increased speed of SDFS, and less clutter on your desk too! 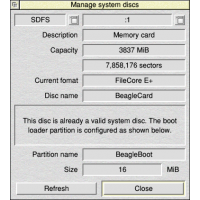 Modern RISC OS systems, such as the Beagleboard, Pandaboard or Raspberry Pi, feature a built-in SD or micro SD card reader. You need to have a memory card inserted into this slot when you power up the board, because their CPUs expect to read files (often known as firmware or bootloaders) from which will in turn load RISC OS itself. These expect the SD card to be formatted with a FAT format - a format whose roots can be traced to MS-DOS or even earlier. The current version is 1.04. This item is delivered by email and requires RISC OS 5. 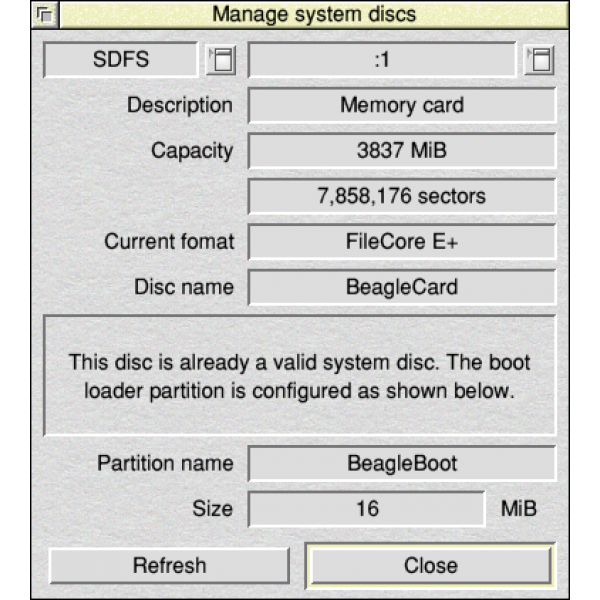 Technical note describing the background to SystemDisc, how to use it, and answers to common questions you might have.